Used Rolls-Royce Ghost for sale in Dubai. Blue 2011 model, available at Luxury Lounge. This car has automatic transmission, a 12 cylinder engine, 20″ wheels and beige interior. 29,000 km, GCC specs. Be sure to check out our video of this Rolls-Royce Ghost above! 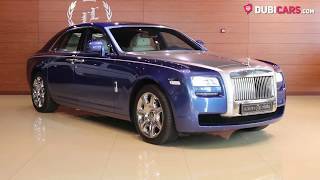 See all used Rolls-Royce Ghost for sale in Dubai. 11x Rolls-Royce Ghost 2014, 14,000KMs Only, Majestic Horse, Warranty til 12/2019, LIMITED EDITION!! !